After: Cabinet built into the shelving to provide extra floor space. The records room was in disarray with little room for movement. The first task was to move the rusty old filing cabinet outside then the boxes on the floor were targeted. Armed with a copy of the guidelines for Normal Administrative Practice we were able to identify many outdated documents and information resources which were no-longer required and dispose of them. This turned out to be most of the contents of the boxes stored on the floor. With that lot out of the way, everything else had to be registered, classified and sentenced before disposal. The functional records could not be classified as the Public Office did not have an existing thesaurus or business classification scheme, and sentencing couldn’t occur until a functional retention and disposal authority had been developed and approved. The general administrative, financial and personnel records were registered, classified and sentenced using GA 28 (Administrative records) and GDA 12 (Personnel records). After approval of the functional retention and disposal authority, registration continued with the functional records. The public office did not use an electronic records management system. Access to TRIM and Keyword AAA was offered by the Land and Property Management Authority, however, this offer was not accepted at the time. Before anything else could be done, a classification scheme had to be developed and a system for registration devised. Without too much effort and a lot of support and advice from Nicola Forbes, an Excel spreadsheet was developed for records registration, and formatted so that it would be compatible with TRIM for uploading in the future. The functions, activities and record classes from general disposal authorities were used to develop a classification scheme, with core functions and activities added after the approval of the functional retention and disposal authority. Having created a Records Register, the next step was to begin with the simplest record class to test the system. Invoices/vouchers were selected as these are quite straightforward to register, classify and sentence. Vouchers had been stored in Box Files since the mid 1980s. The registration of these boxes was quite simple; select a box file, allocate a unique identifier (box number), apply a title using the classification scheme, enter the contents start and end dates, location, sentence according to GA 28(Administrative records) and enter an action required date. Registering over 60 file boxes provided plenty of practice at data entry. This Public Office was in its third location and most of the records had been poorly organised, re-arranged and disorganised over the years during moves and as a result of many searches for ‘missing’ records. After: Safe built into the shelving, wall mounted work table and power points added. Every effort was taken to determine and maintain original order, however, this was not always possible or practical. 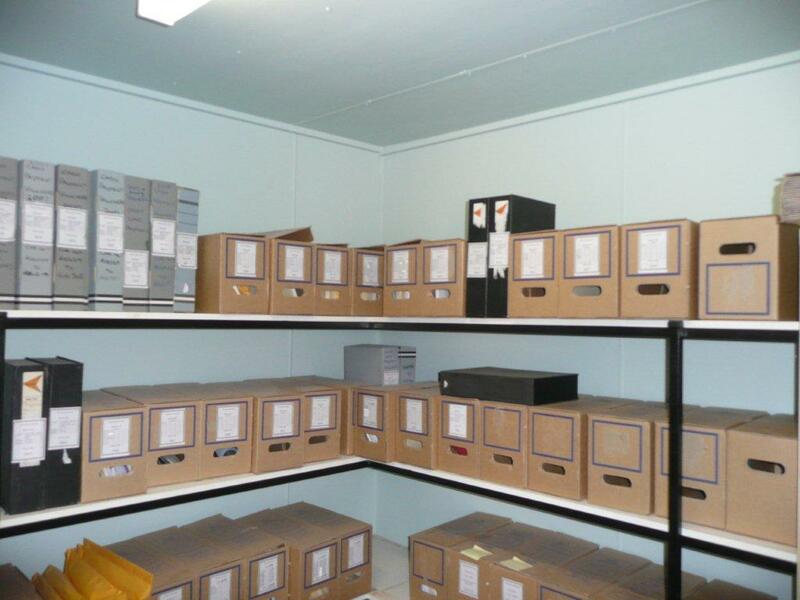 With guidance from an experienced archivist, Nicola Forbes, it was deemed necessary to create personnel files. Only two personnel files existed however many personnel records were discovered mixed in with many other record classes. By the end of the registration process, over 350 personnel files had been created. The decisions to create artificial series and impose order need very careful consideration and expert guidance. 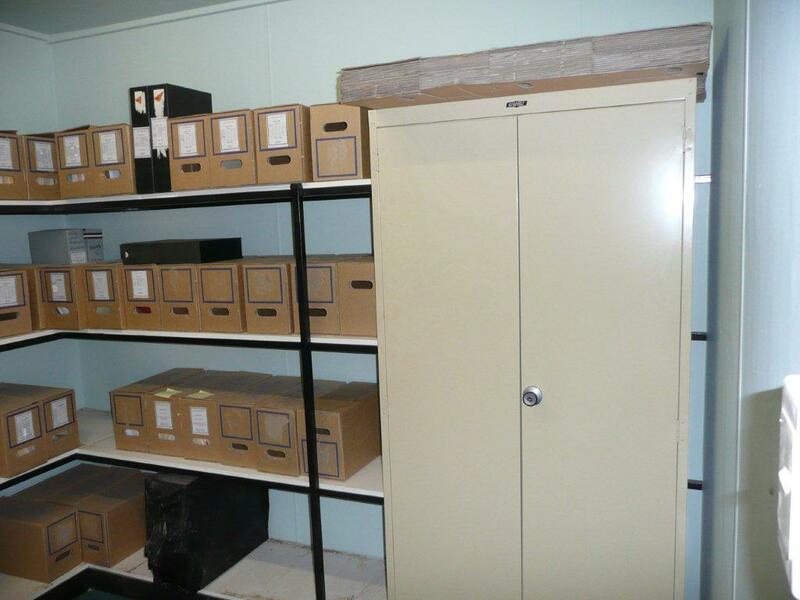 All boxes requiring destruction were set aside, leaving more space in the records room, and the boxes of more recent vouchers which needed to be retained for future disposal were stored on the top shelf which had been cleared. This ensured that processed records were clearly separate from unprocessed records. Disposal actions require that records are retained for a minimum period then destroyed or transferred. Don’t forget that retention periods are only minimum requirements; they may be retained by the Public Office for longer or even permanently. Future research interests and historical value should be considered when developing a functional retention and disposal authority. Considering where the records would be deposited. As the public office was in a regional area we decided that deposit at our regional repository would be most beneficial. A transfer receipt was requested from the regional repository as each consignment was transferred. Understanding and explaining the transfer process to the client including; what transferring custody actually means, the arrangements for future access to transferred records, and gaining approval from the CEO for all transfers. Applying for access directions. Access directions were obtained with the CEO’s consent and applied to all records before transfer. Access direction applications were not very complex when following the Procedures for making access directions and with assistance from someone with previous experience. Applying for Series registration numbers. 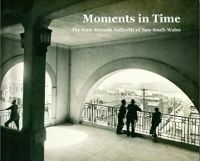 Prior to transfer each record series must be registered with SRNSW which allocates a unique number to each series. Preparing the transfer documentation – Once the access direction and series registration data had been received and entered into the records register all the necessary information was available for completing transfer forms. All transfer forms were available online, including the Transfer documentation upload facility, and State Records NSW provided support and guidance throughout these processes. After: Insulated and lined to reduce temperature fluctuations. The room was made rodent proof by simply adding a weather strip to the bottom of the door, and virtually insect proof by fill the small gaps between the walls and ceiling. The bare cement floor was covered with vinyl to minimise dust levels and facilitate cleaning. Painting the internal walls and ceiling cleaned and brighten the space. A florescent light and power point were installed (previously the room had no light source or power points however electricity was available in the shed). A fold down, wall mounted work table was installed to facilitate future records management activities. After: No more gaps between walls and ceiling, reducing dust and insect infestations. The existing safe was moved inside the room and built into the shelving. 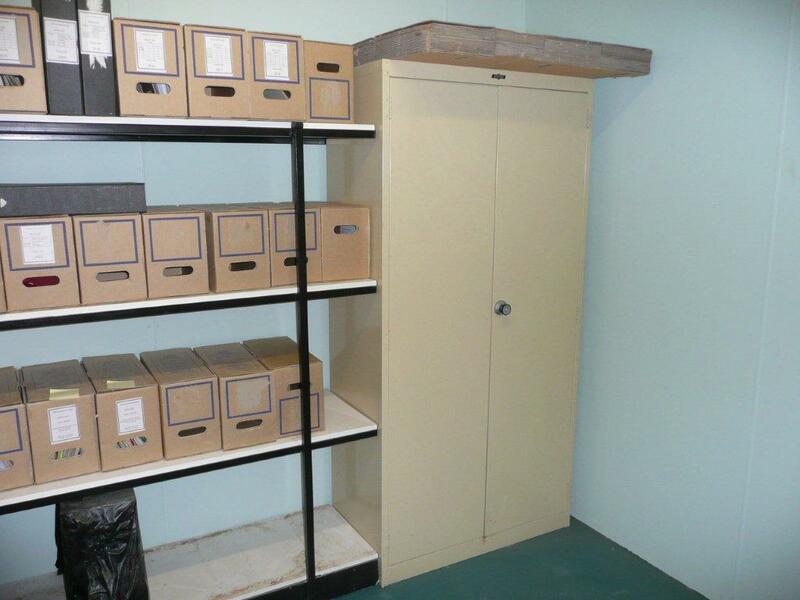 A small section of shelving was removed to accommodate an existing lockable cabinet. New locks were installed on the door for added security. 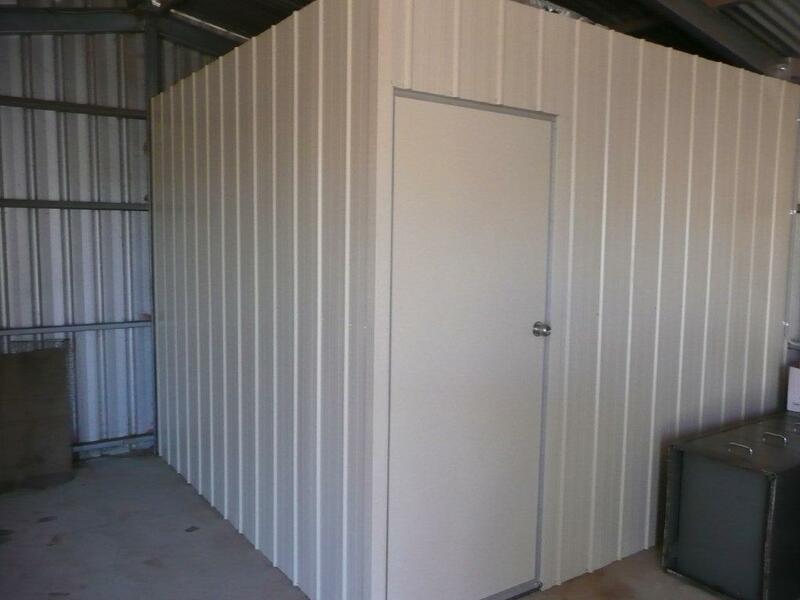 The walls and ceiling were insulated and cladding added, reducing temperature fluctuations. 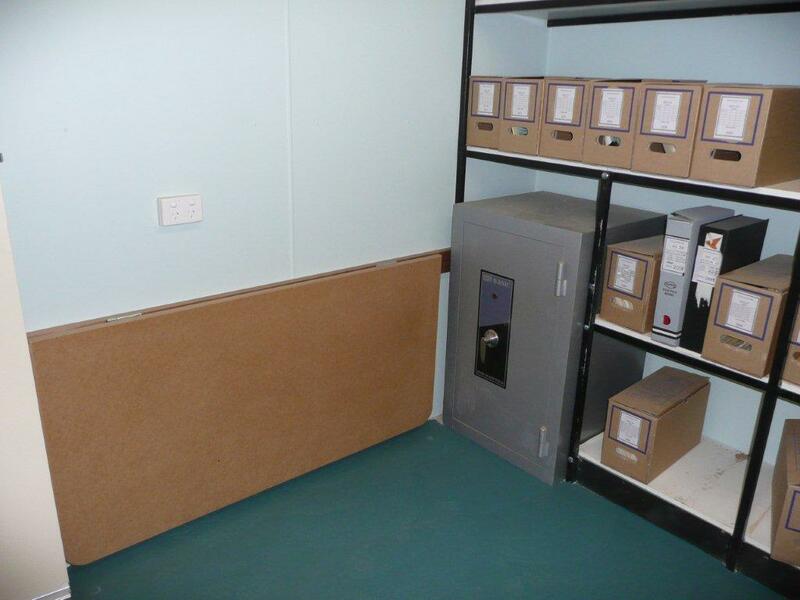 Boxes were moved to the front of the shelves, away from the external walls to further reduce temperature fluctuations and contact with moisture from condensation. The project took 57 days (453 hours) over an 18 month period (excluding renovations). Over 100 boxes were destroyed. There is plenty of help out there, seek it and accept it gratefully. When estimating the size and scale of a destruction project, look closely at the records, not just the quantity of boxes or shelf space. The existing level of records management will greatly impact the scale of the project and time requirements. If the records haven’t actually been organised and filed according to a business classification scheme the project will take much longer than in a situation where all records are registered and classified. What a fascinating article Debra. Thanks for sharing the story – it seems like a great result was achieved. I really enjoyed reading these posts, Debra and I especially liked the ‘before’ and ‘after’ photos you included. What a massive undertaking this job was!